I coach, locally and internationally, executives who wish to enhance their leadership capabilities and all other individuals who are in the process of redefining their career / life objectives. Roman is the founding Partner of Optimus Coaching Solutions, a company providing coaching services to executives at all levels of organizations as well as to individuals who wish to explore Life Coaching and / or Career Coaching matters. Certified by reputable organizations, he coached CEO’s and Top-Level Directors of national and MNC’s in Brasil and Argentina. Prior to fully dedicating to Executive and Personal Coaching, Roman was a Partner at Odgers Berndtson, the 5º largest Executive Search company in the world. In his 11 years tenure Roman conducted several search processes hiring CEO’s, and Top Management professionals. He also conducted numerous Executive Coaching projects coaching individuals at the same level mentioned. He has worked with major multinational companies in the Industrial, FMCG, Life Sciences and Services segments, among them Ford, Mars, PepsiCo, Becton Dickinson and lastly at Odgers Berndtson. During a career span of 34 years, he had responsibilities for BD's Asia Pacific Region (14 countries) as well as for all the countries in Pepsi's Latin America Region, and a short tenure in their Eastern Europe Region (Russia). Born in Argentina, lived for many years in Brazil, Singapore, México and USA. This provided him with a strong multicultural understanding of the diverse regions and countries he has worked and lived in and constitutes a strong asset for his current coaching activity. 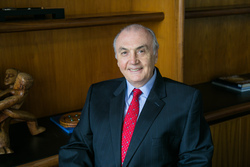 His academic background includes a bachelor’s degree in Business Administration from UADE (Argentine Business University), has completed the CCCP (Columbia Coaching Certification Program) at Columbia University - New York (USA) and the Master and Business Coach certification at Act Coaching International. He attended several leadership programs at the University of Michigan and Harvard University and is fluent in Spanish, Portuguese and English. Have you worked with ROMAN? Tell your friends! ROMAN doesn't have any reviews yet. ROMAN hasn't submitted any articles.